When the offseason of any professional sport commences, there are two major events that keep the fan’s interest: free agency and the draft. While free agency is followed closely in all major sports, the NFL and NBA do a much better job of promoting and generating interest in their drafts than the MLB or NHL. A lot of this is due to the stronger followings in college football and basketball compared to baseball or hockey, which leads to a greater familiarity of the players who are being drafted. As a fan, it is hard to miss the NFL or NBA draft season when you are constantly being flooded by versions of mock drafts ranging from the inaugural “NBA Mock Draft 1.0” to the final “NBA Mock Draft 7.8.” These mock drafts get massive pageviews as fanbases are yearning to see who the experts think their team will add, but rarely are correct on any picks, apart from the first few. With the NBA Draft recently happening, I wanted to look at the accuracy of the drafts the public is most likely to look at, i.e., the ones without paywalls. The six free mock drafts used came from Bleacher Report, the Ringer, USA Today, SB Nation, Sports Illustrated, and CBS Sports. 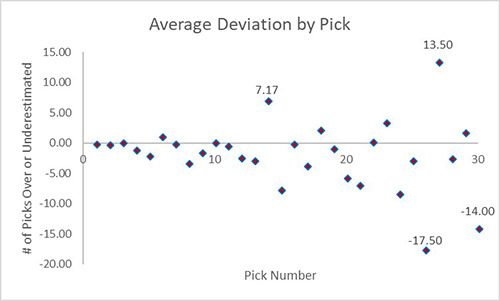 Below is a table of the number of picks that were exactly correct, the number of players they said would be first round picks that were, and the average amount they were off per pick. Based on these results, the Ringer and Bleacher Report appear to have the most accurate mock drafts. Although the Ringer had the most correct picks, Bleacher Report only missed three players picked in the first round and were wrong by the smallest margin on average. The results of the draft can be found here: http://www.nba.com/draft/2018/board#/. All the mock drafts picked the top three correct, except for SB Nation who flipped Marvin Bagley and Luka Doncic. One player that every mock draft included in their first round was Elie Okobo out of France. Okobo was picked 31st, the first pick in the second round, so the drafts didn’t miss by much. Landry Shamet (26th pick) and Omari Spellman (30th pick) were completely omitted from all mock drafts that were used. Bleacher Report had the best all-around mock draft when it came to consistency. They were the only mock to not include Ohio State’s Keita Bates-Diop (the 48th pick) and the only one besides SB Nation to not include Southern California’s De’Anthony Melton (the 46th pick) in the first round. Of their three first round misses, the latest any were drafted was the 35th pick. They were also the only one besides the Ringer to include Anfernee Simons in the first round. Bleacher Reports biggest miss was predicting Robert Williams out of Texas A&M to go 14 picks higher than he did, but every mock overvalued him by at least 10 picks. Besides that, every pick they had was within eight picks of the actual draft position. Every other draft had at least four players off by more than 10 picks, which shows how impressive it was for them to only have one. The Ringer’s mock was impressive for their ability to pick players in the right draft slot, especially outside of the top four picks. Above is a chart of all the right picks each draft had, excluding the top three who everyone except SB Nation was right on. The Ringer was the only one to pick Jerome Robinson, Anfernee Simons, and Jacob Evans at the point in the draft when picking correctly becomes the most difficult. 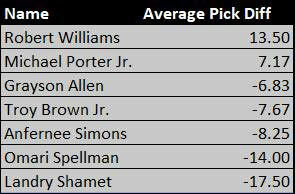 However, they included Bates-Diop and Melton which really hurt how much they were off per pick. They also failed to include Troy Brown Jr. in their first round, who ended up being taken by the Wizards with the 15th pick. While Brown was undervalued and ranked 8 picks lower on average by the drafts I looked at, the Ringer not including him in their first round was one of the most confusing moves I saw. It was more boom-or-bust than Bleacher Report with their ability to hit picks dead on, but also have some big misses like Bates-Diop, Melton, and Brown. Some players were consistently overvalued or undervalued by the media for a variety of reasons. This chart shows the players who were most overvalued (positive number) and undervalued (negative number) by the media. For instance, based on these mock drafts, Robert Williams was expected to be picked 13.5 spots higher than he was. Williams and Michael Porter Jr. both had injury concerns that were a much bigger deal then the media thought. 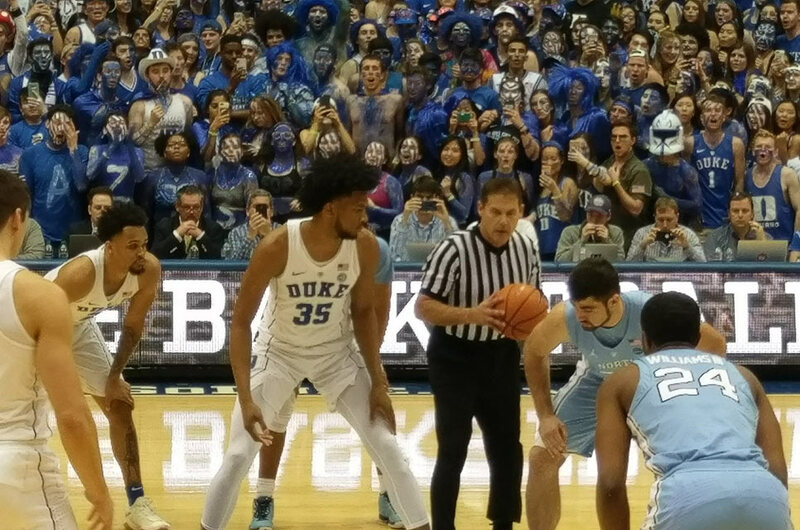 According to basketball insider Jeff Goodman, “multiple teams were concerned and calling around last night about [Williams’] potential knee injury. Williams was also, according to multiple sources, not in great shape.” Williams kept his medical records from teams at the draft combine, which I’m sure caused teams to question what he was hiding. Porter also had an injury history that scared teams off as he had surgery for a herniated disk in his back at nineteen years old. Back surgeries historically are not good signs for professional athletes, and it’s almost certainly the thing that dropped him from a top six or seven pick to fourteen. On the flip side, Landry Shamet had two-foot surgeries, but it wasn’t as much of a concern to NBA teams as the media thought. It comes down to the medical records that are not privy to the public that make it difficult to mock players with an injury history. Another interesting case was Anfernee Simons, a high school shooting guard who declared for the draft after completing a year of prep basketball at IMG Academy. His lack of exposure from not playing college basketball likely caused the media to be less aware of his ability and underrate him. In every draft players go much higher or lower than expected. Unless you’re in the war room with the teams drafting, no one really has any idea how the draft will go down. Media members at these websites rely on tips from sources inside the NBA, but they still get under 35% of the picks right and can be considered the best. While it’s usually not too hard to have an idea of who’s going near the top of the draft, it becomes much harder to narrow it down as it goes on. In the scatterplot to the right, the variability increases as the picks increase and makes a funnel or cone shape. Once you get past pick 15 or so, and especially once you’re in the second round, the mocks go from being 1 or 2 off to more than 5. This width of this funnel, and the error for each pick, only increases the later the draft goes. Because Bleacher Report had the least amount of variation in their mock draft, I would choose them as having the best draft among the ones I looked at from the 2018 draft. 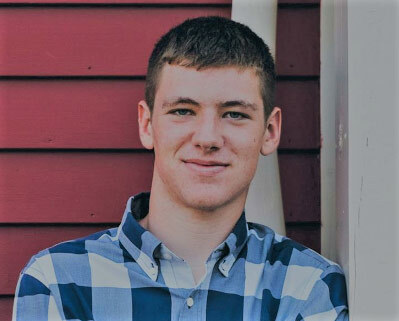 Bio: Nick is a rising junior at the University of South Carolina double majoring in Statistics and Sports Management. He is looking to pursue a career in NBA analytics after graduation.